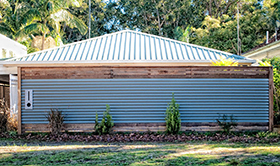 Woy Woy Fencing provides a range of fencing services, from commercial to residential - to customers on the New South Wales Peninsula and its surrounding areas. If you are looking for security fencing, automatic gates, security gates, Colorbond or timber fencing, call us on 02 4341 6973, email us at woywoyfencing@bigpond.com or complete our online enquiry form. "SERVICING THE PENINSULA FOR OVER 30 YEARS"